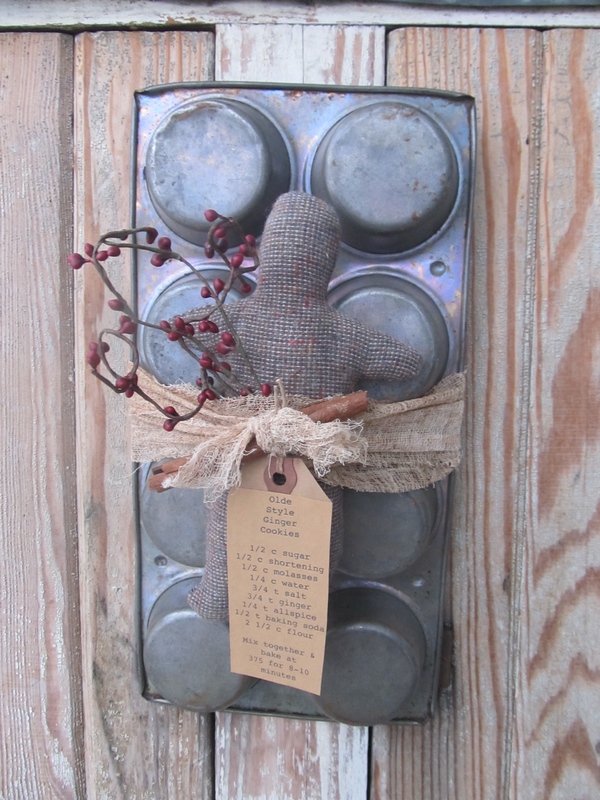 Primitive Antique Muffin Tin with Gingerbread Man-Style C. Each one of these gingerbread creations are unique and hand made by Heidi and Lynn at Gainers Creek. Mom has made her adorable wool gingerbread men. I had these old muffin tins, so together we come up with these. The ginger has been tied on the tin with cheese cloth. A cinnamon stick is attached. Then an recipe on a primitive tag for Olde Ginger Cookies. A bit of burgundy pip berries were tucked down in and there you have it. An adorable, unique, hand made with an antique Gingerbread home decor! Has an attached hanger on the back as this muffin tin didn't offer the hole. This one is a 8 muffin size. Size is 13 1/2" x 7". Only 1 like this one.